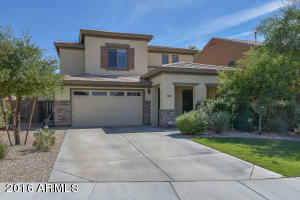 Beautiful spacious home nestled in the lovely community of sonoran mountain ranch. This gorgeous home offers a stunning kitchen with raised panel cabinets, stainless steel appliances, granite counter tops, and a large pantry. A bonus room/den/office complete the main level. Upstairs you will find 4 spacious bedrooms, a built in desk/study area, laundry, master suite with mountain views and a large walk in closet. Close to shopping, parks, hiking trails, and so much more. Don't miss this super clean beauty! Directions: Start From 67th and happy valley. From there, go North on 67th to entrance of sonoran mountain ranch, left on sonoran mountain ranch road, right on ridgeline, right on evergreen, home on right hand side.